Australian Chinese Charity Foundation Annual Dinner was held on Saturday, 14th of October 2017 at the Marigold Chinese Restaurant. The Annual Dinner is one of the two major events organised by ACCF throughout the year. The main purpose of the dinner is to thank the support of our Patrons, Trustees and Members and to present our annual community fund and grant distribution. The continual support to ACCF from the community was demonstrated by having over 400 guests attended the dinner. Thank you to all the distinguished guests, community leaders, corporate sponsors NAB Private, PwC and Invocare Limited, event sponsors, Gold sponsors and media friends. In particular, we have Mr. David Coleman MP Federal members for Banks, representing the Hon. Malcolm Turnbull MP, Prime Minister of Australia, the Hon. Linda Burney MP, Federal members for Barton, representing the Hon. Bill Shorten MP, Federal Leader of the Opposition; Mr Mark Coure MP, State member for Oatley & Parliamentary Secretary for Transport and Infrastructure, representing the Hon. Gladys Berejiklian MP, Premier of NSW; Ms Jodi McKay,MP, State member for Strathfield, representing Mr Luke Foley MP, State Leader of the Opposition; the Hon Ernest Wong MLC, Miss Winnie Chan, Deputy Director of HK Economic & Trade Office; Mr Julian Leeser, MP; the Hon Philip and Heather Ruddock, Mr Derek Lo, legal advisor of ACCF. 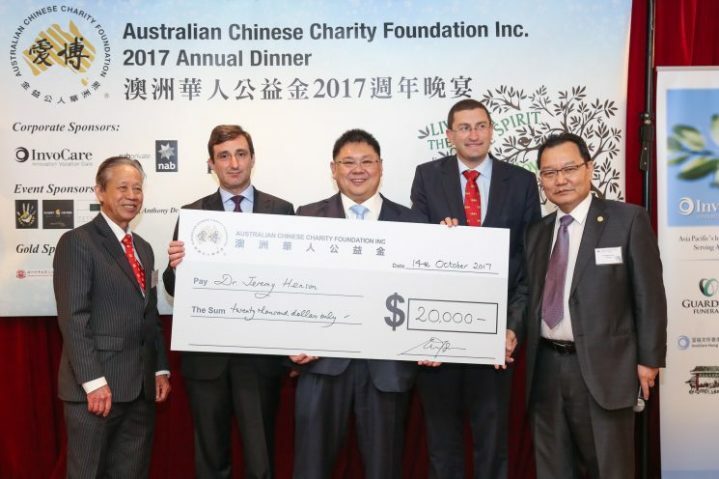 During the dinner, Mr. Wing Yee Warren Lam of the Xin Hui Cultural Centre donated $20,000 to ACCF. In return, ACCF donated $20,000 to Dr Jeremy Henson, Head of Cancer Cell Immortality Lab of Prince of Wales Clinical School for their ongoing cancer research. Mr. Lam further pledged to continue with a yearly donation of $20,000 to ACCF in support of Dr Jeremy Henson for the next 4 more years. Thank you Mr.Warren Lam for your generosity. As part of the annual funds and grants program, ACCF has made a presentation of $93,000 to 27 successful applicants for our community project funding, 4 of which were from interstates. Congratulation to the successful applicants and thank you to the Funds & Grants Assessment Committee – Ms Monica Chu, Ms Gloria Cheung, Ms Stella Fan JP, Ms Cherie Kam JP, Ms Joanna Ng, Ms Faith Tan, Ms Annie Tang JP, Ms Ruby Teng, Ms Cecilia Tsai, headed by the Chairman of the Funds and Grants Committee, Dr Peter Wong AM. During the ACCF Annual Dinner 2 new Patrons (Mrs Winnie Yeung and Ms Ling Ling Wang Chang) and 2 new Trustees (Mrs Judy Ji and Ms Emily Mo) were inducted. I must acknowledge my appreciation for our event sponsors: Handpicked Wine, Harry Georje Diamonds, Tetsuya’s Restaurant and Dr Anthony Ching JP for their continuous support to ACCF. Also our Gold Sponsors: ACETCA, ACJC, B1 Group, Royal Emperor Group/ CEBLC, Way in Network, Xin Hui Culture Centre, Ms Phoebe Alexander, Mr Arthur Kwan and Mrs Rita Kwan and Dr Peter Wong AM. Further, I like to thank the Master of Ceremony, Mr Victor Yeung JP for his effort to keep the program running smoothly. Last but not least I like to express my most sincere thanks to all the members of the dinner organising committee and the venue volunteers in supporting us so generously. It is indeed my pleasure to be able to work with all of you as a team.